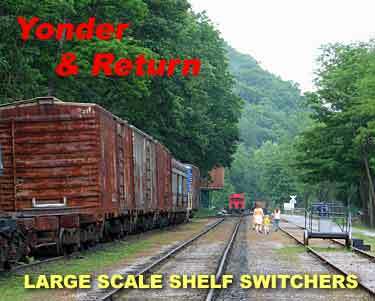 Having discussed small-scale (HO and under) shunting layouts last time, we now take a look at Large Scale (O and up) Shelf Switchers… end-to-end switching layouts that travel from here to yonder and back again. Needless to say, these big boys can all be built in smaller scales in half the space or less! 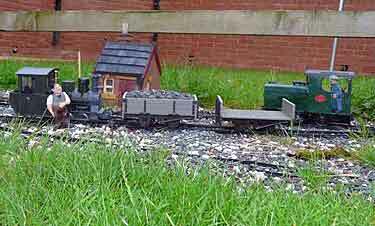 Cadeby II—a 16mm micro railway in the garden! 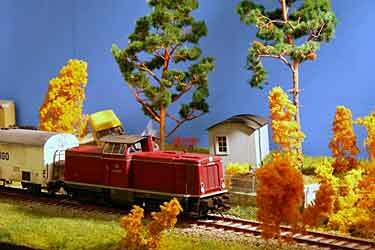 Glen Anthony, from Christchurch, New Zealand, set out to build an animated layout with lots of moving parts. He certainly succeeded! 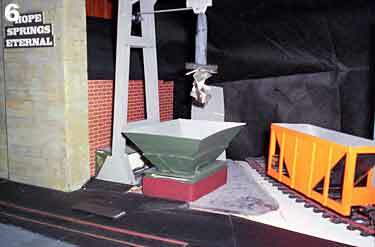 The main module shown here measures 120x50cm (48x20in) and models a gold-mine with a working water wheel, stamping battery and other gold-processing equipent, as well as an automatic car loader at the minehead. 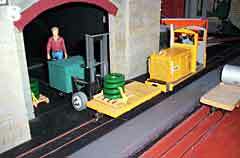 The scale is 1:24 (a variant of G Scale sometimes called H Scale) with its little railway running on a gauge of 16.5mm representing 15in (400mm) narrow gauge. 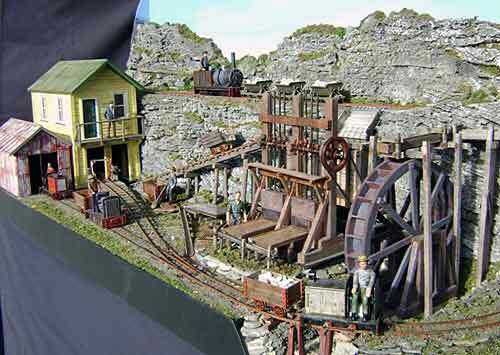 Called The Stamping Ground, this delightful layout is described in more detail at Glen’s website. And don’t miss the video (below)! Since these photos were taken, Glen has added two more scenic modules at the left of this main module. 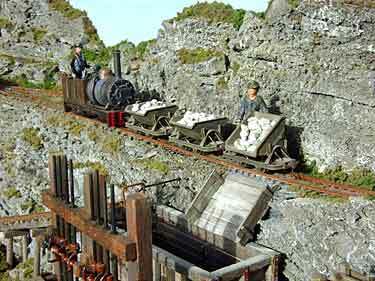 The video below shows the current featured operation: two cars are loaded at the loading bins and hauled across the High Bridge; a miner comes out of another mine adit and tips his wagon into the third car; the train proceeds to the stamping battery where the loads are tipped into the hopper for processing. All tipping is done by levers under the table. To see the video of the whole process, click on the triangle below. 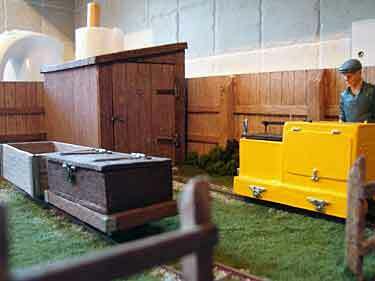 O STANDARD GAUGE ON A FOUR-FOOT BOOKSHELF — WITH TWO SCENES! 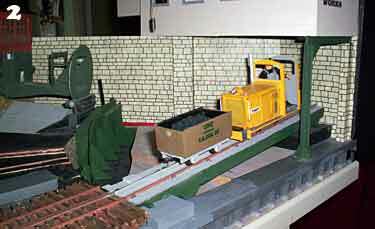 The left-hand section, Ffodos Road, represents a light railway terminal with minimal goods (freight) facilities. “There is no run round loop,” declares Colin, “so trains have to reverse out of the station, the engine uncoupled and run into an off-stage spur siding with the train running back into the platform down the grade. The inspiration comes from Canterbury Road, Wingham on the East Kent Light Railway and Coryton on the Corringham Light Railway in Essex. 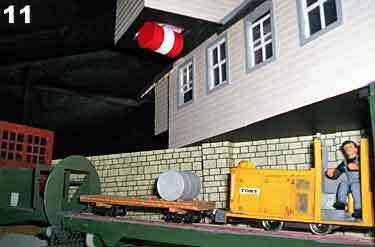 The other section, Ffodos Loco, represents a small locomotive shed, with the usual facilities, somewhere in the U.K. at an industrial concern. Locomotives arrive for servicing then depart to continue with their work. Electrical controls can be plugged into either side of the layout, so turning it around on its TV-turntable mount takes only a few seconds. 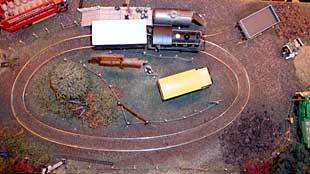 16mm GARDEN LINE QUALIFIES AS A ‘SMALL LAYOUT’! 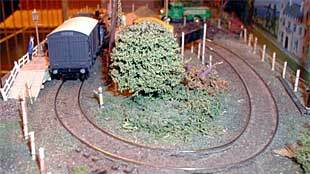 James Finister, who lives near Coventry in England, is working at demonstrating the feasibility of building indoor-style layouts in the outdoor garden, complete with mutliple shunting possibilities and compact track plans. 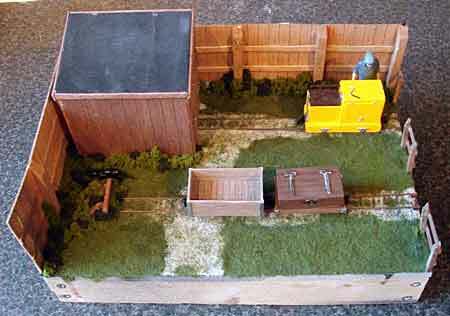 His first try is shown here — it’s an Inglenook switching layout that’s just two meters long (plus overgrown unused extensions for future expansion). 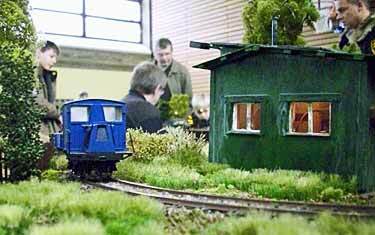 Locos are battery driven, and the track is Mamod 32mm gauge. 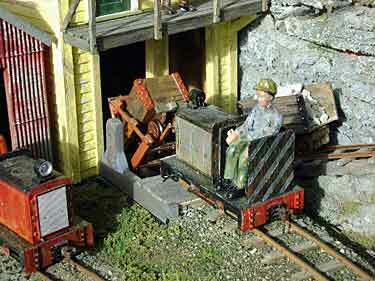 The scale is 1:19, or 16mm to the foot, so the model represents a two-foot narrow gauge railway. It’s not exactly built on a shelf, but certainly is a very similar shape and size! It’s temporarily called Cadeby II, because James is considering using the track plan of the late Rev. 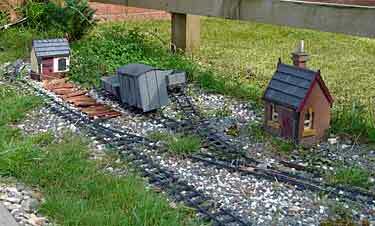 Teddy Boston’s well known light railway model, Cadeby. That’s Rob Bennett’s charicature figure of the Rev. 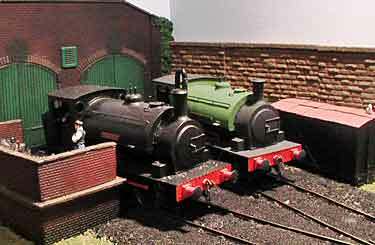 Teddy standing beside the loco in the photo (above right). James and several of his modeling pals are also planning a small indoor-outdoor demonstration shelf line. The plan, referred to as “Nookie”, will be much the same as the center two meters of Cadeby II shown on the plan below. They’re planning to use Faller plastic track so it can move indoors or out. There’s more on their new website. 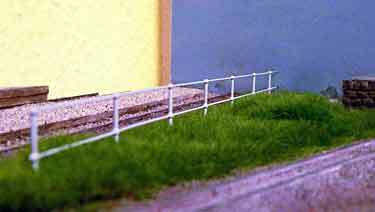 Michael Hanisch, from Hildesheim near Hanover, Germany, was influenced by this site to build his first minimum-space feldbahn railway, Asel, which measures just 170x55cm (67x22in). 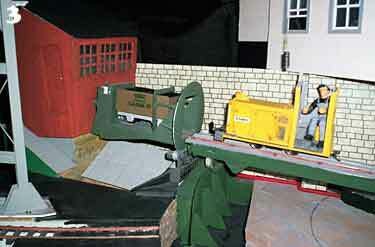 He sent some in-progress photos of the layout, which is being constructed in 0e scale (1:45 on 16.5mm gauge). Can you smell that nicely-modeled pile of sawdust? We hope to show you more pictures of this line as work continues. SWITCH CARGO INSTEAD OF CARS? CHECK OUT THIS AMAZING Gn15 LINE! 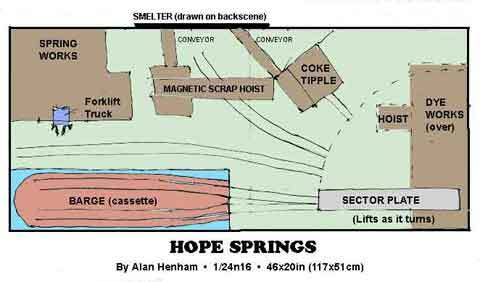 Alan Henham, from Bristol, England, built Hope Springs, a busy 1/24n16 (also called Gn15 or Hn15) in a space just 46x20in (117x51cm). “I decided to try to include as many devices as possible on the theme of ‘switch loads not cars’,” Alan comments. 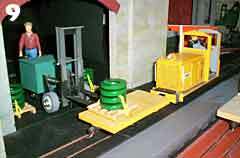 “So there is a cassette (barge), a motorized sector plate which operates in two dimensions [rising and falling as it moves from side to side], a rotary tipple to unload coke, a magnetic hoist to unload scrap metal (yes it does drop it as well as pick it up), a barrel hoist for the dye works and a forklift truck that loads the flat car. Besides creating an astonishing amount of activity in loading and unloading cars, Alan also has invented a backstory that is both complex and incredible. It concerns Ivor Hope, who in 1920 invented Sprainless Steel, from which he manufactured unbreakable springs for export around the world. His product became so famous that his slogan, “Hope Springs Eternal” has passed into the English vernacular. 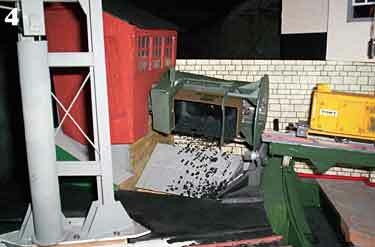 The layout is set in 1949 at the Hope Springs foundry, where we see scrap steel and coke being unloaded from a barge that has crossed the lake. 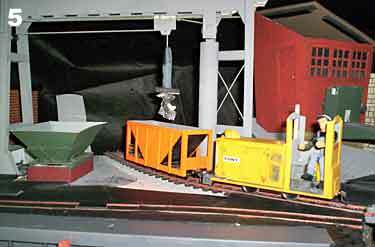 The coke is unloaded in a rotary tipple (above) and the scrap by a magnetic hoist (below). Both are transferred to the smelter via conveyor belts. The finished springs are loaded onto flat cars (above) for the return trip across the lake. In addition, Ivor Hope’s two grandsons, Abe and Owen, set up in business next door producing dyes. Their raw materials also arrive by barge (in barrels) and are unloaded by hoist into the Dye Works (below). 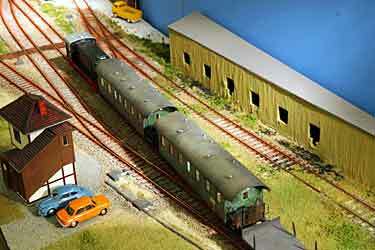 Operating this complicated layout must be a never-ending source of fun and challenges! 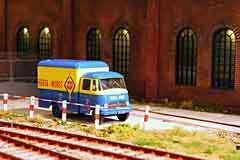 Georg Muerb, from Ladenburg, Germany and his son, Benedict, build model railways together. When they decided to try a minimum-space layout, they were inspired by Chris Krupa’s Ryelands Lane, in Scrapbook #36. 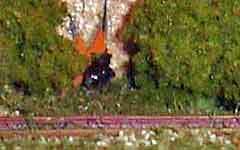 They planned a Welsh slate line of two-foot gauge, in 0 (1:45) scale. 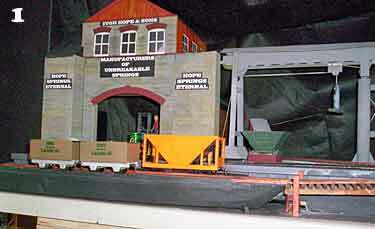 The resulting plan measures 100x40cm (39x16in) without fiddle yard. The line enters from the fiddle yard that represents the mountains of Wales. 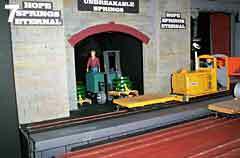 The terminal features just a small locomotive shed and a freight house over the two freight tracks. Track 1 is reserved for passenger service at the small platform, while Track 2 may become a through track and extend beyond the limit of the current baseboard to a small nearby port or an industrial plant. 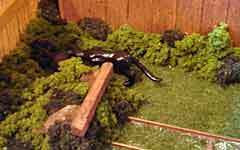 Benedict made the substructure and baseboard, along with much of the scenery. In these construction photos he’s shown (above left) placing a tree made from a dead ficus. Trackwork (above right) is made from Tillig H0m (12mm) trackage, nearly buried in gravel so its sectional-track origin is hard to detect! The rail line emerges from beneath the overpass (below left) from the fiddle yard, which is the same size as the main baseboard and will travel beneath it. 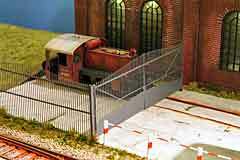 At present Georg and Benedict are busily scratchbuilding the rolling stock for this layout as well as continuing work on the scenery, including some convincing grass and a railing adapted from an H0 ship’s railing (below right). There’s still lots of work to do, but the target date for completion is Easter 2009! 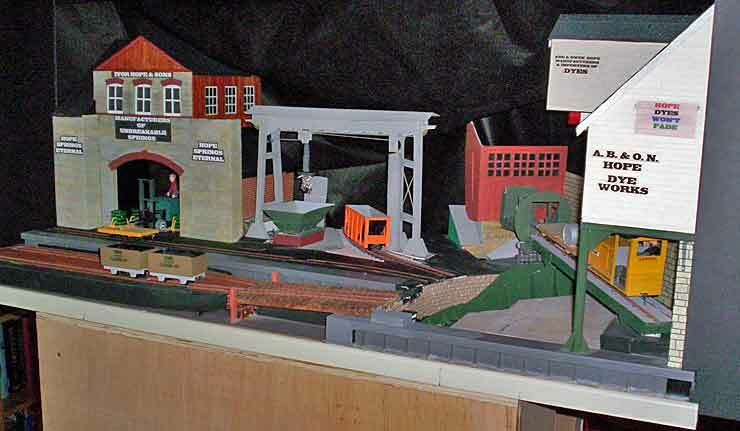 Nick Ellingworth, from Wymondham, England, took inspiration from Steve Bennett’s seminal layout, Simplicity Sidings, as seen in the Gn15 Gnatterbox forum. 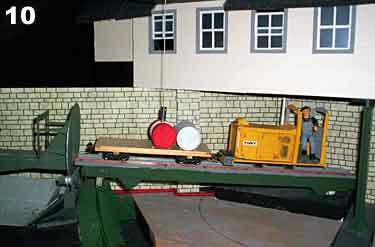 “I’ve built a very simple two track shunting layout, Dunwold Manor Sidings, which uses a cassette to move a loco and wagon from one track to the other,” Nick continues. 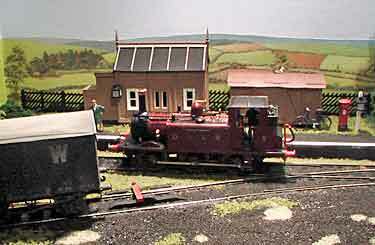 “The setting is the sidings around a small engine shed in a quiet area of an estate. I’m using the rather odd scale/gauge combination of G12, which uses G scale on 12mm (TT/HOm) track to represent a real-life gauge of between 10¼ and 12¼ inches. 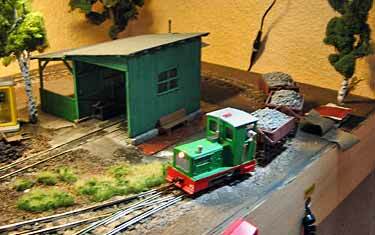 HERE’S AN O-SCALE TIMESAVER IN JUST 2 METERS (PLUS FIDDLE)! Stefan Karzauninkat,from Hamburg, Germany, has built an 0 scale version of John Allen’s famous Timesaver switching layout. The heart of the action takes place on two modules, each 100x60cm (39x24in), for a length of 2m (78in). 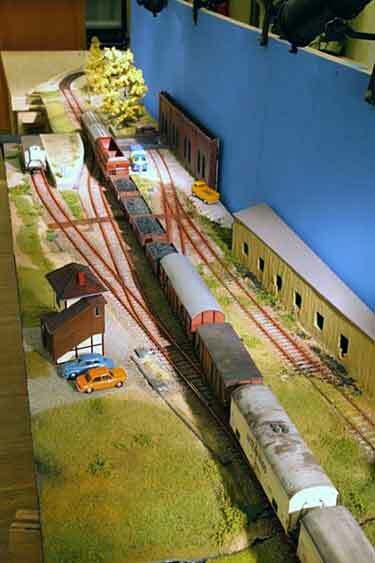 A stretch of straight track is needed at each end for operation, and Stefan has built them on two 100cm modules also. So the entire 0-scale enterprise requires just 4m (13ft) of shelf length! At exhibitions, Stefan takes advantage of the modular nature of his design, and he adds an oval circuit of track on a series of tables (see below). This provides continuous running to keep things moving when the engrossing switching problems are not being solved. You can learn much more about this layout at Stefan’s website (in German). He’s still adding details, some of which are shown below. In particular, the realistically animated gates are operated on video; just click on the triangle to see.